They’re adding stuff, the Top of Their Field geniuses at The Global Secular Council. We get to watch them add stuff. These two furry heathens do not suffer fools lightly, as they are both staunch proponents of the separation of church and state. When lounging in direct sunlight, they have a propensity for summoning the unwitting to their soft stomachs. A simple enough gambit, they let others pet them for the perfectly calculated amount of time, before the naïve are swatted at with more speed than a Hitchens one-liner. 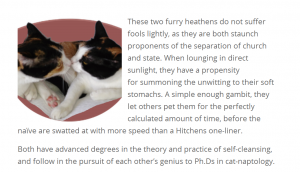 Both have advanced degrees in the theory and practice of self-cleansing, and follow in the pursuit of each other’s genius to Ph.Ds in cat-naptology. Isn’t that just adorable? Doesn’t it make you forget all about wondering what the hell this handful of white mostly-males from the US/UK has to do with anything global? Aren’t Bella and Stella just a perfectly fine substitute for people with some actual global reach and experience? Why wonder where Taslima Nasreen and Maryam Namazie and Gita Sahgal and Pragna Patel are when you can have Bella and Stella? Get rid of the rest of the “council” and I’ll support Bella & Stella’s Meowtastic Secular Litter Box. Can’t be worse than what we already have! – May I say again that ALL are white, native english speakers from US/UK? That’s it, or did I miss something? A project of the Secular Coalition for America, the Global Secular Council amplifies the diverse and growing voice of the nontheistic community in the United States and globally. Well, from the point of view of a south-american brazillian (me) it is coherent with using “America” as a synonym for “United States of America”. So much for Global. The “amplifies the diverse…voice…” is a ‘nah…just kidding’ moment. It seems like “the world’s leading thinkers” would know the meaning of diverse. So either they have their heads so far up their own assholes they think they are diverse, or maybe they just don’t really care. I don’t know why anyone would trust an organization with a major funding source ($150,000 matching grant) unknown and hidden behind a cutesy image. (Though they’re certainly emulating their models – Heritage and Cato – quite well.) It appears to be a spinoff of the SCA, but who’s paying the salaries of its 10 staff members and its other expenses? The lack of transparency, not at all in keeping with the values of this community in general, is especially troubling given the ugly history of the RDF – abuse of the trust of longtime contributors, accusations of embezzlement,..
Let’s just put Bella and Stella in charge of the whole shebang. Feline cuteness may not have anything to do with influencing global policy, but neither does the organization’s mission statement, as far as I can tell. And at least kittehs are cute to look at.